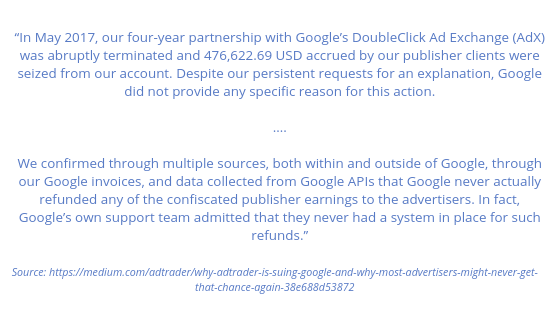 In December 2017, advertising platform AdTrader issued a class action lawsuit against Google. Both AdTrader and a separate investigation from the Wall Street Journal alleged that the search engine had been illegally disbursing advertisers Google Ads funds. Shortly after this investigation, Google conveniently amended their Google Ads contract prohibiting any class actions to be taken against them, essentially removing advertisers rights to a trial by jury. Unfortunately for Google, not all contracts are enforceable. Almost a year later, Google has started to inform those advertisers impacted that their Google Ads data will be made available to a federal court on Wednesday 5th December 2018. 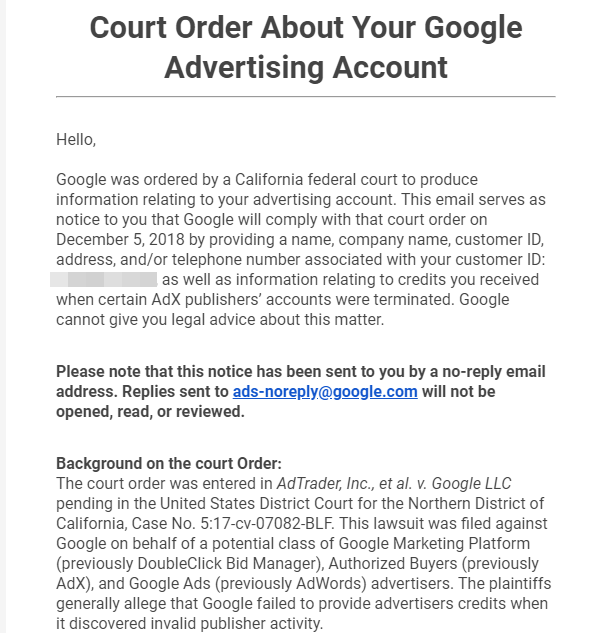 The lawsuit claims that Google failed to appropriate the correct amount of credits to advertisers using DoubleClick bid manager, AdX and Google Ads platforms. Essentially, AdTrader poses that Google had been comfortable in the knowledge that ad-fraud was taking place on their networks and played a blind eye to it. In short, the above quote explains that Google failed to have a structured system in place for such refunds and obtained half a million dollars for themselves. How Are Google Ads Advertisers Going To Be Affected? At the moment, there is very little Google Ads advertisers can do. For the purposes of the investigation, your Google Ads account data will be made available to the Federal Court. Aside from this, no other action will be taken. The lawsuit is not your responsibility and you will not be required to take any action yourself. Going forward, due to the nature of the lawsuit it is unlikely that advertisers will have to take any action themselves. However, if you have been affected it may be wise to keep an eye on the case to find out how it unfolds. Has My Account Data Been Handed Over? If you have not been contacted prior to reading this blog, it is unlikely that your data will have been handed over. Any Google Ads advertiser who has been affected by this will have received the email below. Click fraud cases are becoming more and more prevalent within the Google Network. As it stands, the above case has demonstrated that Google will not refund you or your Google Ads account for fraudulent clicks. This is why Mabo has created their own Click Fraud Protection tool. The Mabo Click Fraud Protection Tool analyses every click that comes through your Google Ads and matches it to over 100 factors. From this, our tool determines whether the click was genuine, suspicious or fraudulent. If the tool believes the click to be fraudulent, then it will be blocked. Once the click has been blocked, our tool will calculate potential savings, giving you a figure so you can assign a ROI figure. To help you decide whether Click Fraud Protection is the right solution for you, you can try our tool for FREE for two weeks. Fill out the contact form below and a member of our award-winning team will be in touch.